So the top panel of the Color Picker shows the currently selected color. The next panel shows the set of named theme colors defined for the document. A small ‘s’ in the bottom left corner of a patch indicates that the color has other shades of that color associated with it and these are indicated by the smaller patches beneath (like with the yellow color above). You can also show this just by moving the mouse-pointer over any color patch. In this case it shows the red color is called Theme Color 1, and it has other shades associated with it. 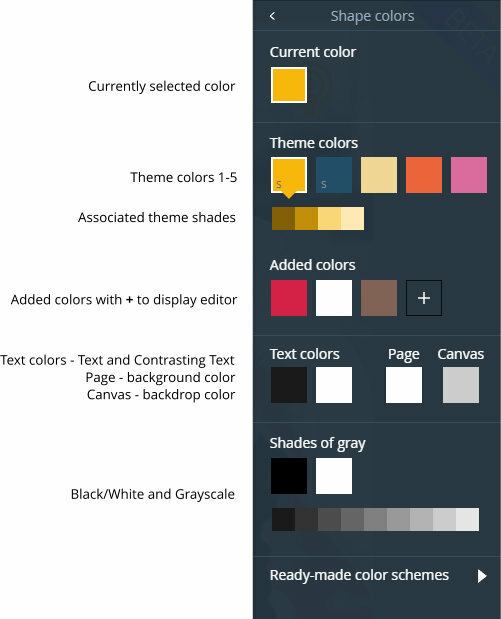 There are two menu options - to Change Theme Color 1 or create a New Shade of Theme Color 1. Both of these will open the Color Editor. The Added colors are all the subsequent colors added to a document aside from the theme colors. The Text colors display a text color and also a contrasting text color should the document contain one. The Page and Canvas colors display the document background color and the color of the background canvas itself. The black and white colors appear for all documents and are shown on a line of their own at the bottom, together with a greyscale that you can use to to select intermediate shades. Selecting the + button will also open the Color Editor to create a new color. Most documents have an alternative selection of Ready-made color schemes. To see them select the option at the bottom of the picker and they will slide in on a panel.